Guns of all shapes and sizes, if not used for crime, can be a reliable asset to have around. It provides its user a form of defense from all kinds of intruders, be it robbers, rapists, or serial killers. This allows the gun user to survive and escape a potentially life-threatening situation. To say the least, having a gun or two in a place where you can reach them can easily remove all your worries of getting assaulted in your own home. Collecting guns is also a hobby for many people. But just like how these weapons can be used for our safety and protection, it is also our responsibility to take care of them. We do not want these weapons falling into the wrong hands. First of all, having several loose firearms can get you in trouble, and secondly, each of these babies cost a fortune to acquire. It is your job as a gun owner to keep ownership of the said weapons. It is for you and your community’s greater good. Now how do you keep a bundle of high-caliber weapons away from a dedicated group of robbers? If they do manage to break into your home, they’ll be quite frustrated to see that you’ve stored your collection into a heavy-duty and reliable gun safe. Now the safety of your guns will depend on what kind of model you bought and how it can truly keep your weapons and other valuables within the tough steel walls. Thieves can get very crafty, so there are many things to consider before we can consider a gun safe truly “safe”. Fortunately, you have found this guide. Here we will discuss the ins and outs of a decent gun safe, as well as the right things to look for when buying one. Get your pens and notepads ready. The biggest, most important part of any gun safe is its exterior, also known as the shell. This is the first thing that robbers will come across and observe if they ever do locate your safe. They will assess the entire gun safe to find its weaknesses so they can penetrate it. Make sure they won’t find any. That said, you must look at the size, weight, strength, and wall thickness of a potential gun safe before buying it. First of all, you should make sure that your vault can actually store all your weapons inside. It should be big enough to house every single piece comfortably. Not only can a larger gun safe conveniently carry everything within, it is also arguably harder to move. The recommended height for gun safes, according to experts, is at least 58 inches, so it can be tall enough for long barreled rifles. Many collectors also opt for at least 36 inches in width, so they can stack several guns together, vertically. It is recommended that you purchase a gun safe that is slightly larger than what you think you will need, because you’ll never know when you’ll need the extra space. Assess your collection, see how much space you will need, and plan accordingly. In terms of weight, the rule is typically “the heavier, the better.” A large and heavy gun safe should be enough to prevent would-be thieves from just carrying the entire thing and escaping the crime scene. They will worry about opening it later. A 2000-pound will be very difficult to lift and even tip over, but it will also require professional assistance to install into your home. A lighter gun safe will be easier to relocate, but it will also be slightly riskier than the heavier versions. The shell must be extremely durable, and must not be easily penetrated by power tools. A heavy gun safe is one thing, but one that has the strength and thickness to survive blunt force is another. A well-constructed gun safe is built with continuous welds instead of stitch welds that are linked with body filler. It will be hard to determine which welding style was involved in the construction of a vault, so it may be a good idea to ask about the product before buying it. Additionally, the thickness of the steel walls affect the gun safe’s durability, either by enhancing its strength, or providing robbers an easy access to your valued treasure. The more affordable models give you thinner steel panels that don’t offer much protection from persistent criminals who actually know how to break them and have the heavy-duty tools for it. 10-gauge steel is the recommended minimum thickness, for your guidance. Also keep in mind that there are other reasons for a safe to break, even those that do not involve human interaction. For example, a few heavy beams may break loose and fall onto your gun safe if a fire occurs in your home. A strong gun safe would withstand the impact, thereby keeping your items safe. Fire itself is a very real threat to gun safes, which is why many models offer a fireproof or fire resistant shell. While many users and reviewers argue over the effectiveness of these fireproof vaults, it is generally a good idea to find one that offers a decent protection from heat. Another factor that is often overlooked by gun safe buyers is whether the vault can survive water. Believe it or not, this is a real problem that some models may face. Even if your gun safe can withstand a house fire, it wouldn’t be of much use if all your items are drenched with the firemen’s high-pressure hose. Also, flooding is a common occurrence, so it’s always good to look for ways to waterproof your vault. Some safe makers include so-called “flood guards” to help protect the contents of a submerged gun safe, for a limited period of time. This should be enough to spare your precious gun collection. Now that we know about the shell, we will next explore the hinges of the vault’s door. While there is an impression that internal hinges are safer than external ones because it conceals the door’s apparent ‘weak points,’ most reviewers actually prefer external hinges. This is because a decent gun safe should have several bolts to hold the door down when locked, even if the hinges are cut off. So the truth is, external hinges only provide additional accessibility to its user because the door opens wider. Vaults with internal hinges do have a sleeker appearance, if that’s what you are after. Since you will be the one storing your items inside the gun safe, you will do more ‘accessing’ than ‘breaking and entering’ it. The way you do this will depend on whether you picked a vault with a mechanical dial or a digital lock. Dial locks and digital locks are different in the same way the words ‘manual’ and ‘automatic’ are. Mechanical dial locks are less convenient, and slower to open, but are generally more durable than electronic locks. Digital ones offer ease of use and locks automatically when you close the safe, meaning you don’t have to do it by yourself. While both are very reliable ways to keep your vault door locked, it really depends on your needs and preference. Bolt Operation: This is the number of locking bolts within a gun safe’s door. These ensure that your vault stays shut when you close it. It is better to go for a higher number of bolts, because of the added security. Cheaper gun safes only have bolts in the spots where they are most needed, and that isn’t necessarily a bad thing. Door Seals: A good gun safe will have a door seal that keeps out moist air, therefore reducing the risk of rust forming on your firearms. It also resists heat, smoke, and flames, keeping your vault’s door unbreakable. This is a handy feature that ensures practical invulnerability for your gun safe’s entry zone. Durability is the name of the game for the gun safe market. You will have to explore all the different functions and features of countless vaults just to find one that fits your collection perfectly. The decision may be hard at first, but you will soon figure out why all of this is necessary. A gun safe is a lifetime investment. It is one of those products that do not deteriorate over time. Meaning you can keep this stashed away in a hidden corner of your home, keeping all your valuables safe for all the years to come. 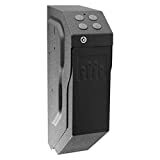 Five Best Gun Safes in Amazon Best Sellers. Discover the best Gun Safes in Amazon Best Sellers. Most popular products based on sales. Updated every 12 hours. Durable & pry-resistant: mit robustem, 16 Gauge Stahl Gehäuse. 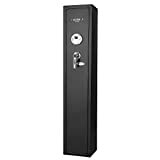 Mehrzweck-sicher: XXL (29,2 x 21,6 x 6,3 cm) Lock Box bietet sichere Aufbewahrung für Handfeuerwaffe, Schmuck, Bargeld, Medikamente, Pässe, Tablets und mehr zu Hause, auf dem Nachttisch, im Auto oder auf Reisen.